Another exceptionally hot day in Chennai – and back at home around 7 pm, saw Bangladesh at 50 / 3 – not a happy one when knew that they were chasing only 105….. a debutant Taskin Ahmed with 5/28 restricted India to such a low score and joined Fidel Edwards (22/6); A Dodemaide, SKarnain, A Codrington (Canada !) in that list of debutant bowlers of success. On a gloomy day in Mirpur, a two-and-a-half hour rain break reduced the game to a 41-overs-a-side affair – Bangla skipper had earlier expressed disappointment that India had sent “A” side …. – it so happened that the teams put together did not last 41 overs…. First India was all out for their lowest against Bangladesh – then the improbable or was it waiting to happen. A 19 year old rookie Taskin had shaken the Mirpur. The Sher-e-Bangla National Cricket, also calledMirpur Stadium, is in Dhaka and has the capacity to hold approx 25ooo people. It is named after the Bengali statesman A. K. Fazlul Huq, who was accorded the title Sher-e-Bangla ("tiger of Bengal"). ~ and would you ever have imagined that somebody who had played for Hyderabad Heroes in 2007 would be the man of the moment. Recall that there was Indian Cricket League funded by Zee Entertainment ….. for Hyderabad Heroes – 2 of the present team – Ambati Rayudu and Stuart Binny played. Before we go into details, in the 1st Investec Test at Lords, Lankans gamely held on to a draw… in a match that saw 3 hundreds and a double by Joe Root, the finish was as dramatic. After the penultimate ball of the match, and Stuart Broad in full flow, England's fielders converged in jubilation, convinced they had completed a footslogging victory with seconds to spare. But in their excitement they had overlooked one thing: Sri Lanka's last man, Nuwan Pradeep, might be a batting novice, but he knows how to signal for a DRS review. Broad heard only the thwack of a fullish ball on pad. But rarely has the top of a bat been patted so defiantly. Replays revealed a thick edge, missed by the umpire Paul Reiffel. Sri Lanka survived. England for sure will rue the 17 overs lost due to slow over rate and intentional delays. Today, the son of former Indian allrounder Roger Binny who had a great day in 1986 at Leeds with a 5 wicket haul and another 6 at Kolkatta had a great day.. 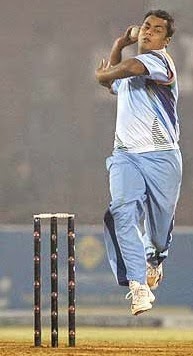 He has played twice for India in One dayers this year – but has not taken a single wicket……………. Today Stuart Terence Roger Binny who had rode on powerful IPL performance was a different tiger for Bangla. He had unbelievable figures of 4.4-2-4-6 – while his partner Mohit Sharma had 4/22 in 8 overs. Bangladesh from 44/2 had been bowled out for 58 – India winning by 47 runs defending 105. Incidentally, Roger Michael Humphrey Binny’s 6 for 56 came at Eden Gardens in Feb 1987. In that match Gavaskar had opted out ostensibly citing personal reasons - reportedly unhappy at his treatment by the Eden Gardens crowds – bringing to a close his run of 106 consecutive Test matches. With regards – S. Sampathkumar 17th June 2014.